The three characters in this game are one is a monster “Yummy” who lives deep in the mountain, another is a fairy caterpillar “Cattie” who is the best partner of Yummy, and the other is a little boy “Chico” who is 5 years old and will be supposed to live together with Yummy has got down from the mountain. 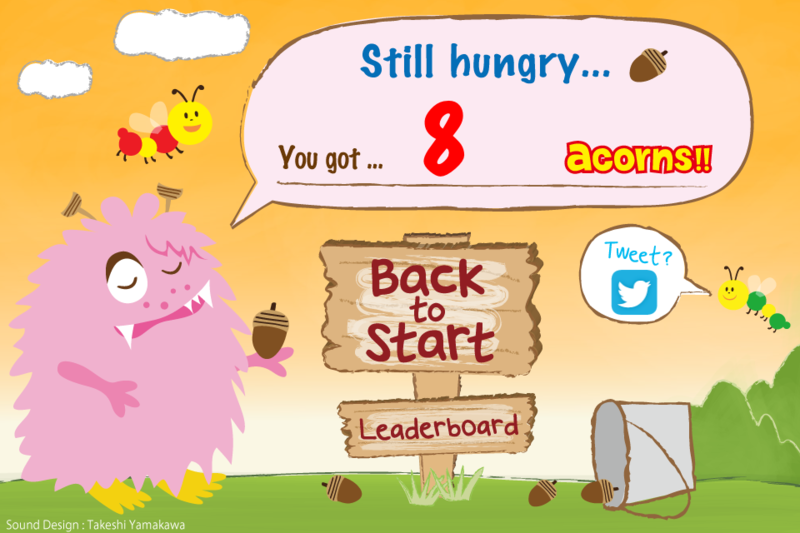 The Yummy’s favorite food is an “acorn.” This is a game how many acorns you will collect within 1 minute. 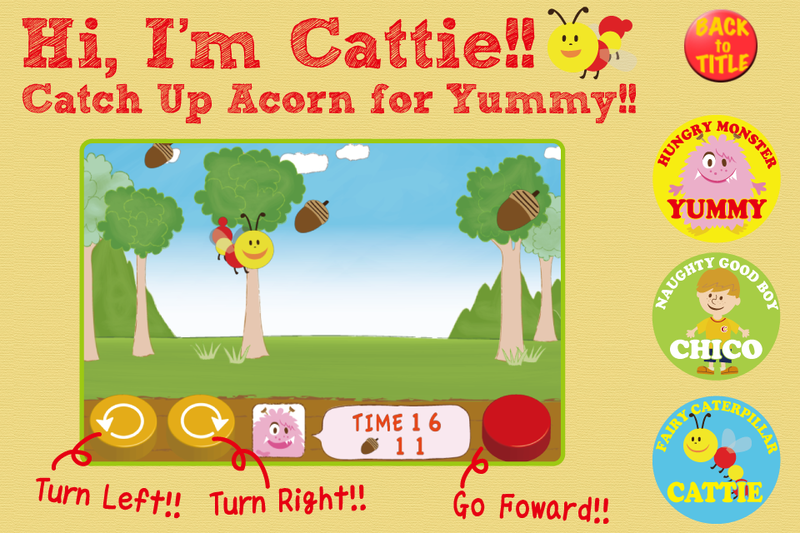 A player will control Cattie who flies in the air to catch the acorns that come down from the sky. It is simple operativity and mounts the good interface so that young children would like and play easily. There are three controllers in this game which two controllers that determine the direction and an accelerator button where Cattie progresses. The place the acorns drop down and the size and speed of the acorns are set up at random, and Cattie moves in the screen and catches an acorn. BGM, which flows into a game, is also one of the charms of “CatchUpAcorns.”The players would be fun and enjoy avidly with fairy and airy music, and simple design makes them happy, too. All characters of the game, Yummy, Cattie, and Chico, appear as leading characters in another iPhone application “A Picture Book of Learning English” which will be released for kids by onTheHammock in the feature. 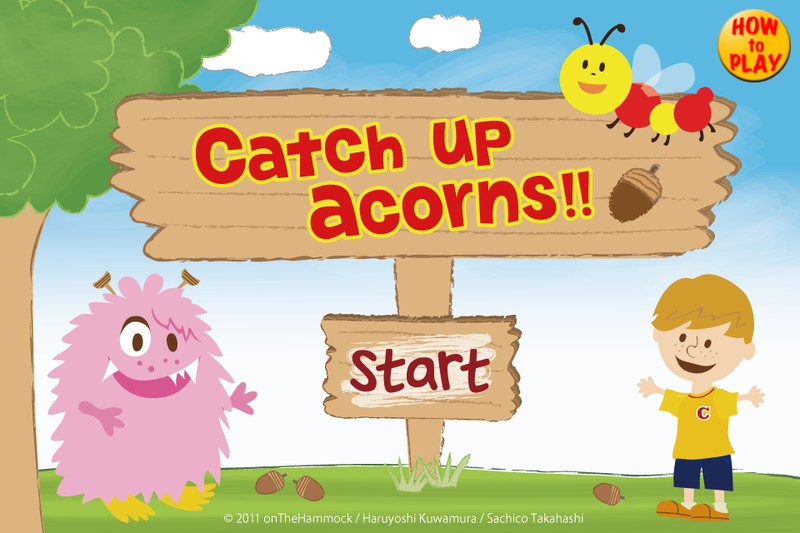 We supply this “CatchUpAcorns” as an introduction of “A Picture Book of Learning English” which is supposed to be released soon; therefore, it has been inserted English words that characters speak. 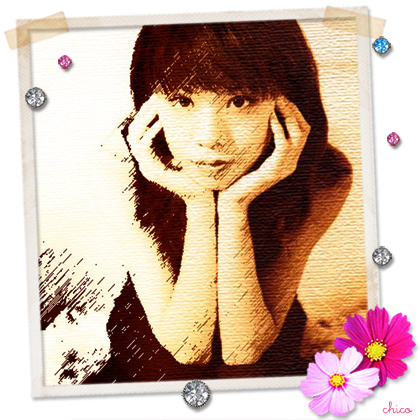 Also, we are pleased players enjoy and get this application so that they learn English with playing it. 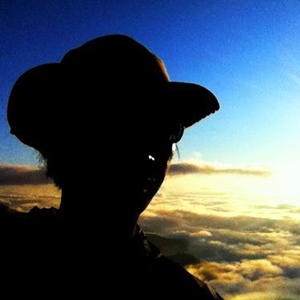 onTheHammock LLC © All Rights Reserved.